May 16, 2018 by Amelia Arria, Ph.D. The feeling of sending a grown child off to college for the first time can be described as a strange mixture of pride, relief and severe anxiety. What do parents need to know as their adult child takes this big step? As a public health researcher, I have some good news to share, and some reminders about what to be aware of during this critical transition for both you and them. The first piece of good news is that your voice matters. Your child might not tell you, but when researchers have asked them about your influence, they find that parent attitudes and the rules you put in place during their development are major influences on their risk-taking behavior. Preparing and protecting your child from engaging in excessive drinking during college starts way before “drop-off” day. Even in middle school, and throughout high school, sending a clear message of your disapproval for underage drinking is critical and equally important in college. The second piece of good news is that the prevalence of binge drinking is trending downward among college students. Binge drinking is defined as consuming four or more drinks for females or five or more drinks for males within a few hours (where “drink” means 5 oz. of wine = 12 oz. of beer = 1.5 oz. of hard alcohol). Why Do Kids Binge Drink? Many parents ask, “Why do students continue to drink to excess when they clearly know it is risky?” There is no simple answer to that question, but here are a few things to think about. First, we know that adolescent and young adult brains are “primed” for risk-taking and exploratory behavior — some more than others. But in general, college students are likely to focus on immediate rewards and an experience that might make a “good story” later than think about the possible consequences of their behavior. Unfortunately, the consequences of this sort of behavior can change a life trajectory very quickly. A second driving force behind excessive drinking behavior is the perception that it is normative and accepted — the idea that “everyone is doing it” — when in fact it’s a minority of students. Many schools try to send messages about the relative rarity of very heavy consumption of alcohol to correct these misperceptions by students. Third, there are many individual-level factors that heighten one’s risk for binge drinking, like being impulsive, or having a tendency to break rules. Lastly, the availability of alcohol is key. For example, where there is widespread access and low prices, there will be a greater likelihood that students will engage in heavy drinking as compared with places where access is more limited. 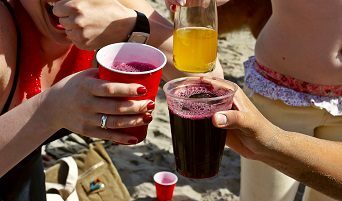 A concerning trend is high-intensity drinking, an even heavier pattern of alcohol use defined as drinking twice the binge threshold (drinking eight or more drinks for females or 10 or more drinks for males within a few hours). 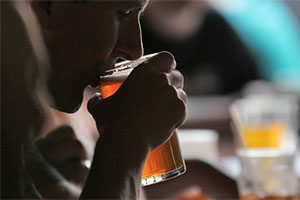 Approximately one in 10 college students engaged in high-intensity drinking during the past two weeks, and it is more common among male students (17 percent) than female students (6 percent).3 While high-intensity drinking is decreasing among males, it has remained stable among females. How Do I Talk About Binge Drinking with My Son or Daughter? When your child leaves for college, maintaining open, regular communication can help you understand what kinds of drinking opportunities exist on campus and in the surrounding community. Setting a regular time to talk, such as every Sunday afternoon, can be helpful. The communication should send a clear message that you expect them not to drink. However, not every conversation needs to be explicitly about alcohol. Check in with them about their friends, roommates and classes to get a sense of what’s going on in their lives. This is especially important during the first few weeks of college, as this is the biggest time of transition, but conversations should continue throughout their college career. In addition to being a sounding board for them, knowing what’s going on in their life can help with identifying warning signs of an alcohol problem. Asking about how often they are going to class, whether or not their sleep schedule is disrupted, and/or whether or not they have been able to concentrate well are possible conversation starters because all of these issues can be related to drinking too much or using other drugs. If you suspect that your child might have an alcohol problem, identify the resources available on campus. Although it varies by school, some colleges have clinicians on campus who can assess your child for an alcohol problem and refer, if needed, to treatment options. Suspecting that your child has an alcohol problem can be very upsetting, but it’s best to have this conversation in person while keeping a calm and supportive tone. The main point is that as a parent, you see how much personal and professional potential they have, and you know that underage and excessive drinking and drug use during college can be very distracting and get in the way of fulfilling their potential. If you do discover that your son or daughter is drinking underage against your wishes, learn how to best confront him or her and how to productively work through the conversation. For more tips on starting the conversation about alcohol with your child, please visit www.collegeparentsmatter.org. 2 Hahn, L. (2009). Don’t toast your teen. Good Housekeeping, January, 85-85. The overprescribing of prescription pain relievers has been a major cause of the opioid epidemic. Know what to ask when your child is prescribed opioids.